Sometimes a picture can say more than thousand words. 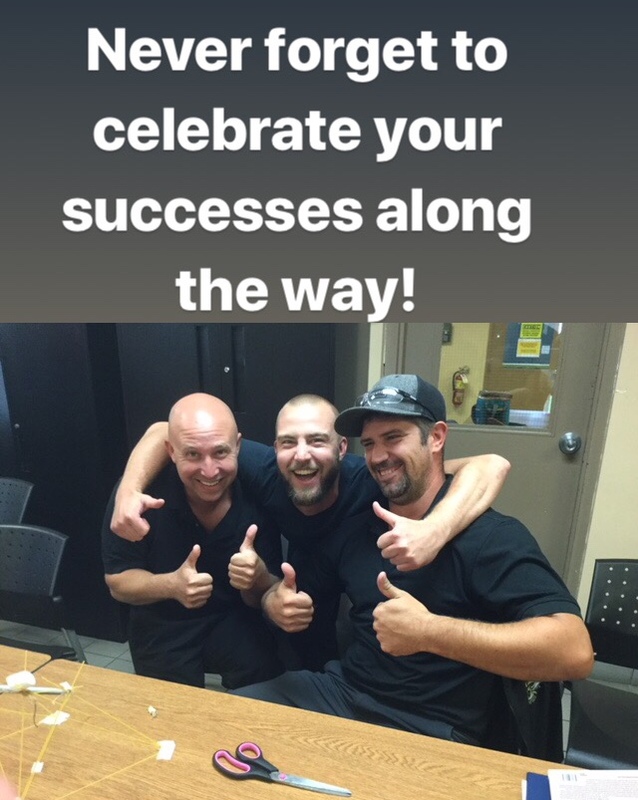 This “celebration shot” was taken at one of our most recent workshops, and I sincerely hope that these guys continue to celebrate every small and big success along the way. Can you see the joy, excitement and fun that Bob, Matt and Mark had after completing the Marshmallow Challenge? They had a plan how they could win this game as a team, believed in that plan and executed extremely well “together”. Their strategy was “better safe than sorry”, and it paid off. Congrats guys! Most people in manufacturing companies overlook to consciously and continuously evaluate their effort and their progress. In our work with different organizations in different countries we notice that there are some commonalities. The majority of people would like to add value to their organization, contribute their ideas and go home with a sense of purpose and self-satisfaction. Why do you think is it so difficult to show thumbs up to ourselves and the people around us? Write down your success (big, small, tiny) every time you have one – whenever you have a bad day, read through your “success journal”. It will help you to feel better. Acknowledge that progress is better than perfection – no matter how slow you go, as long as you move into the right direction, it is a win. Reflect on your progress and be grateful for how far you have come. Thank people individually for their support and let them know specifically what you appreciate about their work. Reward yourself by doing something that you enjoy doing – go home earlier to be with your family; allow some extra time for exercise; take a day off work; go out for dinner; and the list goes on. Great energy matters. If you want to create a momentum that helps you to get further faster, you and your team have to feel good about yourself and about your progress. Believe me, a good celebration can do the trick.